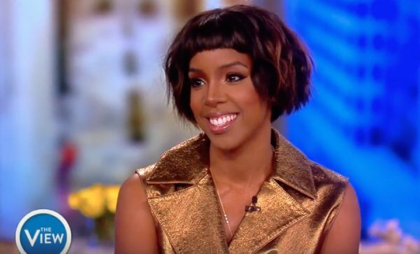 Brown boned beauty Kelly Rowland has officially entered that literary lane as she is now a author. The singer/actress released her very first book titled Whoa, Baby that hit bookshelves this week. The book is aimed at new mothers & she shares her experiences & tips that she has learned along the way since becoming a mother to her son Titan Jewell. Today, she was a guest on The View to promote the book as well as speak on some other topics. During the chat Rowland talked about the struggles she faced trying to balance being a new mother & her successful work life. Kelly even spoke about fans being upset over not receiving any new music from the Grammy winner.